Of all the insects in the world, ladybugs somehow manage to seem the most friendly. Growing up, I was always keen to hold a ladybug even when I was not a fan of many other insects. If you’ve got little ones who are fascinated by ladybugs, the books below would be a great starting point for indulging their interests. The non-fiction books about ladybugs reviewed below are a great resource for teaching kids about the ladybug life cycle. Although I highly recommend you pair reading these books with observing the ladybug life cycle in action by raising your own ladybugs in a Ladybug Land. Note: You will find more resources for learning about ladybugs and other insects on my Insect Unit Study page. I absolutely adore Gail Gibbons’ work, and this book is another winner in my opinion. Gibbons uses bright illustrations along with technical but not overly complicated text to teach young children all about ladybugs. This book covers ladybug food preferences, ladybug anatomy, the great variety of ladybugs that exist, where ladybugs live, the ladybug life cycle, ladybug predators, and even some interesting historical facts involving ladybugs. This book is appropriate for kids in preschool through grade 3. This is an adorable book with a cute concept involving pages of different sizes. The shortest page discusses the egg stage of the ladybug’s life, the next shortest discusses when the egg hatches, and so on until the longest page where the reader learns about the ladybug’s life as an adult. The illustrations in this book are stunningly detailed. The text provides information about the ladybug’s life in a story-like way. For young preschoolers, grownups may prefer to focus just on the story text. But for older children, there are additional factual details pointing to different parts of the illustration that will make for a more enriched learning experience. This book begins with the question, “Are you a ladybug?” This book is written directly to the reader, who, for the sake of the book, is assumed to be a ladybug. 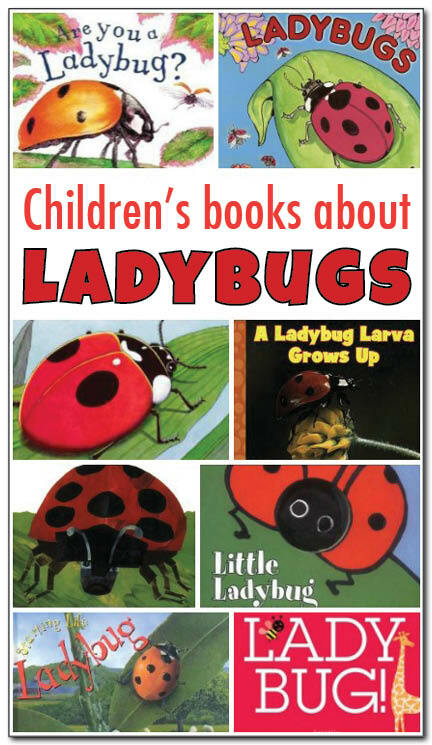 The book describes what ladybugs look like, what they eat, their life cycle, and various other interesting facts. The writing style will encourage young readers to really think about what life would be like if they were a ladybug like the ones described in the book. The level of detail and its humorous approach make this book best suited for kids in kindergarten through about 3rd grade. This book features close up photographs of ladybugs in different stages of their life cycle. Using concise text and few words, this book conveys the life cycle of a ladybug using scientifically accurate terminology that will still be understood by preschoolers. This is a great book about ladybugs for kids ages 3-6. This book takes us through the life cycle of a ladybug. We watch as an egg hatches and out comes a ladybug larva. She eats aphids and grows bigger, until she changes into a ladybug pupa, then a ladybug beetle. She goes in search of food, enjoying some mealybugs. She narrowly escapes the beak of a warbler and the clutches of a praying mantis. A young child picks her up and send her on her way with a blow of air from his mouth. Eventually, the ladybug finds a mate so she can lay her own eggs. Although this book presents factual information, it does so in the form of a story. Each page includes only one line of text, so this book will be accessible to and enjoyed by kids ages 3-5. This is a classic children’s book by author Eric Carle of “The Very Hungry Caterpillar” fame. This story begins early in the morning, when two ladybugs are both eyeing the same aphids for their morning breakfast. The kind ladybug offers to share. But the grouchy ladybug wants them all to herself, so she challenges the the kind ladybug to a fight. When the kind ladybug accepts the challenge, the grouchy ladybug says “Oh, you’re not big enough” and flies off. Each turn of the page shows a clock marking the passage of time, and each hour the grouchy ladybug challenges a new animal to a fight. But when each accepts her challenge, she continues to insist the animal is not big enough and flies off. At the very end of the day, the grouchy ladybug ends up back at the same leaf, feeling contrite and appreciative, and finally willing to share. In this book we meet a ladybug who loves to hide. “Yoo-hoo, Ladybug? Where are you?” we call out. Each page then shows a different scene, and the reader is invited to find the ladybug hidden on the page. This book is sure to be a hit with toddlers and preschoolers who love hide and seek games. This is an adorable board book about ladybugs for babies and toddlers. The text is simple enough to engage the youngest children. But the best part of this book is the ladybug finger puppet that is built right into the middle of the book so children or their grown ups can act out the part of the ladybug. Very cool website. Thanks for sharing.